San Roque Apartment Enquiry Form - Click Here ! This magnificent spacious 2 suite apartment is built and finished to the highest standards. Set on the natural slope of the spectacular San Roque Golf Course with enormous south-facing terraces commanding incredible views to the mountains, the Mediterranean and Africa. The property includes a storeroom, car & buggy parking. Although the apartment is unfurnished, the large Siematic kitchen/diner is fully equipped with Siemens Fridge/Freezer, Microwave, Oven, Hob, Dishwasher and Washer/Dryer. The apartment is entered though a large rustic style security door, with security alarm. There is an entrance hall with a large bedroom and family bathroom adjoining. The bathroom is fully fitted with marble and the bedroom has handmade built in glass paneled wardrobes. There is an archway entrance into the extremely spacious living room which has several TV, telephone and electrical points, allowing the room to be configured in several ways. The living room also gives access to large private terraces which give fantastic sea and mountain views. The other access to the terraces is from the master bedroom which has large double patio doors. The master also has a large section of glass paneled wardrobe space, as well as a large bathroom with a magnificent sunken bath, set in marble with a striking silver trim. The San Roque Golf & Country Club is an exclusive golf resort situated in Southern Spain a few minutes from the beautiful marina of Sotogrande, 40 minutes south of Marbella and within sight of Gibralter. Our apartment looks out to the shimmering Mediterranean Sea. 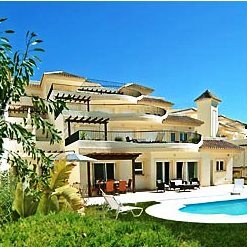 It is a peaceful and secure gated golf resort situated between Sotogrande and Gibraltar, 10 minutes drive from the beaches of Alcaidesa and Sotogrande and within 10 minutes drive of a host of excellent golf courses including Valderrama, La Reserva, Sotogrande, Alcaidesa, Almenara and La Canada. The luxury San Roque Golf & Country Club offers guests excellent on-site facilities: Pool, Tennis Courts, Bike Paths, Clubhouse, Controlled Access and 24 hour security, Courtyard, Fitness Center, Golf Course, Playground/Park, Public Transportation, Spa/Jacuzzi, Sports Complex. Accessible from Malaga (1hr), Seville (1hr 15mins) and Gibraltar airports (20mins) this new apartment offers an extremely high standard of comfort.